When Trees are transplanted up to 80% of the productive roots may be lost. Therefore it is important to help your new trees through the first couple of years. Proper watering, fertilization and insect/weed control are important factors when establishing a tree in its new environment. Following transplantation, reduced vigor and leaf size is often normal in deciduous trees and slight browning may occur in coniferous. These symptoms will grow out as the tree becomes established. Dig the hole larger than the root ball and backfill using existing soil amended with 20% triple mix. 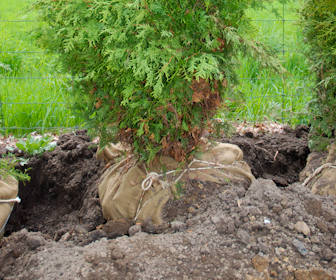 Plant trees slightly above grade and leave root ball basket and burlap in tackt. The wire basket will rust away in time and the burlap and rope will degrade within a few months. Finish off with a good quality mulch to a depth of 3". Mulch regulates soil temperature, retains moisture, keeps weeds	down and helps break down heavy soils. Water thoroughly at planting time and continue to water through dry periods. To avoid over watering, use a sprinkler and soak the surrounding area. Do not over water. Most transplant problems are caused from too much watering. Fertilize at planting time with a good quality water soluble fertilizer. 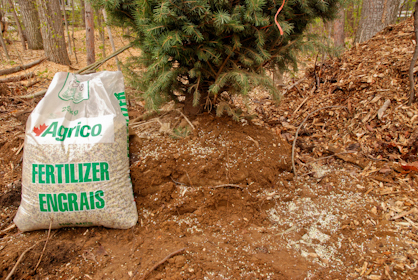 Maintaining a program using a 20-20-20 or a 30-8-8 water soluble fertilizer will help to ensure healthy growth of your new tree. The standard mix for these types of fertilizer is 1/4 cup to 5 gallons of water. Check manufacturers instructions before applying. Trees can be fertilized once a month for April, May, June and then again in September. Broken branches may be pruned at planting time. Unwanted new growth around the base and up the trunk of deciduous trees can be pruned at anytime. Any corrective or shape pruning may be done following the first year of growth. All pruning tools should be cleaned in rubbing alcohol prior to use to prevent against disease. 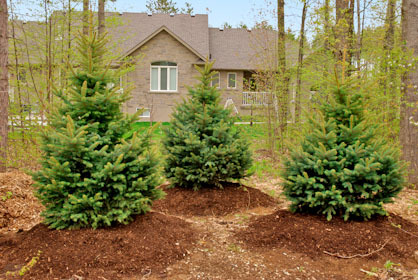 A sharp edge should be kept between the mulched area at the base of your tree and your lawn. Using a spade to dig about 2 or 3 inches deep will make the edge of your lawn look cleaner around the tree while also preventing grass and other weeds from spreading into the mulch around the base of your tree. Keep sod cut well back from tree and mulch topped up. In clay soils continue to aerate surrounding area. This improves drainage and soil conditions and promotes root growth. Try to fertilize once a year and water during dry periods. Keep a look out for anything out of the ordinary. Insect and disease problems can usually be rectified if found early enough. Trees grown at Beveridge Tree Farms are under warranty for a period of one year provided proper horticultural care has been taken. Warranty does not cover any delivery or planting charges on replacement trees. Damage due to weather, insect disease, over/under watering, mechanical injury, poor soil condition, pollution or improper planting are not covered under warranty.